Discover our different hematopoietic stem cell workflows and find the one that fits your experimental needs. MACS® MicroBead Technology provides a broad range of marker-specific, magnetic cell enrichment solutions applicable for stem cell isolation. CD34 is a well-established marker of human hematopoietic stem and progenitor cells, which can be targeted for magnetic enrichment of this cell type. The CD34 MicroBead Kit UltraPure contains MicroBeads directly conjugated to CD34 antibodies for magnetic labeling of CD34-expressing cells from peripheral blood, cord blood, bone marrow, or apheresis harvest. CD34+ cells were isolated from a debris-rich PBMC sample using the CD34 MicroBead Kit UltraPure, two MS Columns, an MiniMACS Separator. Cells were stained with CD34-PE, CD45-FITC and propidium iodide solution. Cells were analyzed after gating on propidium iodide–, lymphoid cells. StemMACS™ HSC Expansion Media XF enables robust expansion of hematopoietic stem cells from cord blood, bone marrow, or peripheral blood. Combined with the StemMACS HSC Expansion Cocktail, a set of cytokines, this xeno-free culture medium can be used to preserve high levels of primitive CD34+CD133+ hematopoietic cells. 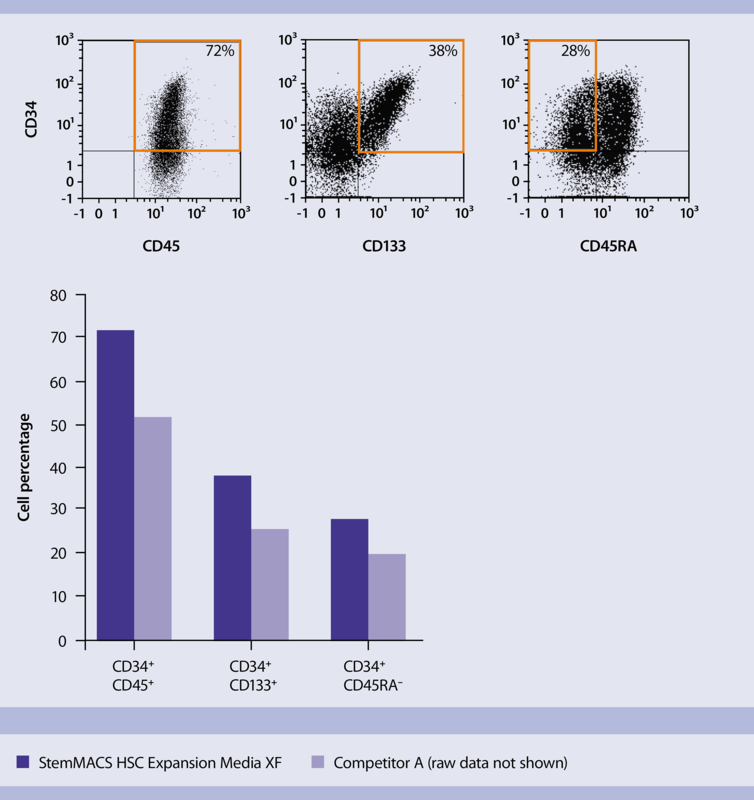 StemMACS HSC Expansion Media XF maintains high levels of CD34+ cells during expansion. 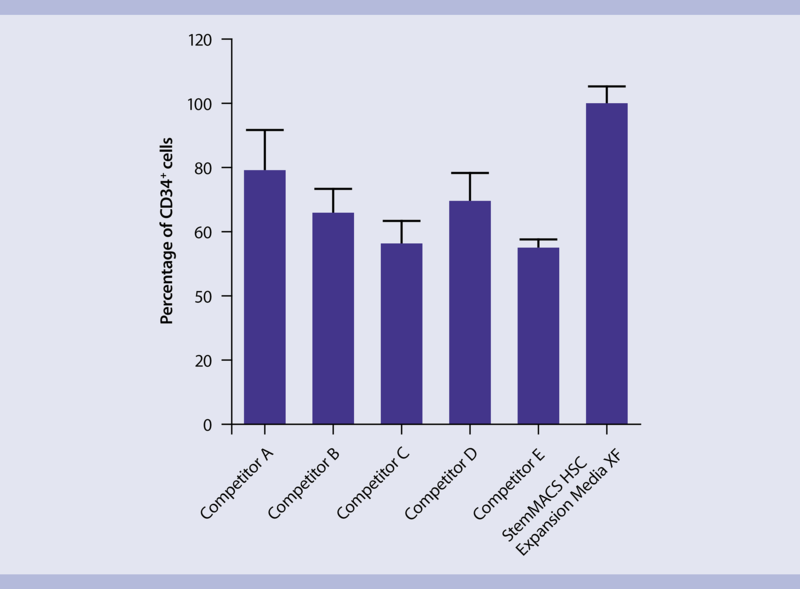 Cryopreserved CD34+ cells separated from cord blood were expanded for 7 days in the indicated media supplemented with StemMACS HSC Expansion Cocktail (n=4; mean +/– SD). Values were normalized to StemMACS HSC Expansion Media XF. StemMACS HSC Expansion Media XF consistently maintained high levels of CD34+ cells during expansion. Flow cytometric analyses provide you with quantitative information about the expression of intracellular as well as surface markers and let you assess the efficiency and quality of your viral transduction in just a few simple steps. Cells expanded in StemMACS HSC Expansion Media XF maintain the characteristic surface phenotype of early hematopoietic progenitors and typically show a higher proportion of phenotypically primitive cells as compared to a competitor product. CD34+ cord blood cells were expanded in StemMACS HSC Expansion Medium XF or an alternative medium supplemented with StemMACS HSC Expansion Cocktail for 7 days. The cell surface phenotype was assessed by flow cytometry. Cells expanded in StemMACS HSC Expansion Media XF maintain the characteristic surface phenotype of early hematopoietic progenitors and typically show a higher proportion of phenotypically primitive cells.